I suppose I shouldn't be surprised that Microsoft is throwing Halo-level amounts of money at Ryse: Son of Rome's marketing campaign, crowned by this new miniseries, but this is pretty much the vanguard of their Xbox One launch line up. At least for me, it capitalises on one of the two things that draws me to Ryse, which is it's ancient Roman setting. 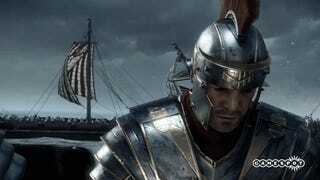 Video games need way more trips to Ancient Rome, especially when they can look as visually stunning as Ryse does. It's such an untapped setting that I'd love to see more from. That said, it's a shame these episodes aren't much longer, as the production values look pretty good for a webseries. Episode One (the horrendously titled Fvneral) doesn't show much beyond the murder of Marius' family, but it does look rather nice whilst doing so. The guy playing Marius even looks pretty close to his in game counterpart, but I can't tell if that's a boon on the series' behalf, or the fact that Ryse has some bloody gorgeous looking character models in it.